In our huge area, We have a big greenhouse, water lily pool, ponds and farms. Our greenhouse is completely air-conditioned which offers cool breeze in summer and warmness in winter, even in rainy days you can enjoy and have fun visiting Kachouen comfortably. People with disabilities who uses wheelchairs and families who have baby carts should not worry because our park is barrier-free, everyone can enjoy and have fun visiting our park. Since almost all birds in Kakegawa Kachouen are not caged, you can interact with them directly. They may look scary at the beginning, but once you get used to them, they are adorable. 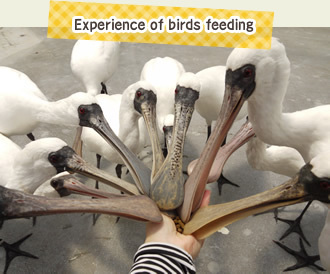 With feeding experience, you can watch birds eating from your own hands from up close. You can take a photo with great-individual birds of Kakegawa Kachouen. For example, you can take a photo and capture your memories of putting an owl on your arm, hugging a penguins, and etc. 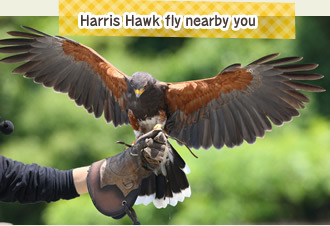 At the bird show, birds will fly low altitude nearby your side and perform lots of special skills. You can have an enjoyable and thrilling moments. Various birds (e.g. owls, Harris Hawk, etc.) will perform. 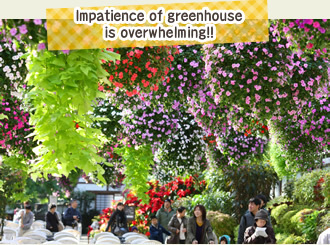 In Kakegawa Kachouen, you can enjoy the sights of various flowers at any seasons. Blooming flowers hanged down from greenhouse ceiling are overwhelming. We plant various kinds of water lily at the water lily pond, you don't want to miss to take a peek at our colorful water lily ponds. * During Golden Week, Lantern festival and the year-end thorough New Year holidays, we operate from 9:00 to 17:00. * Senior and handicapped fare is applied to only those who satisfy its condition. * If you want a group entrance, please contact us at the following number in advance. * Due to our guidelines, you cannot enter with your pets. The shinkansen (bullet train) will stop at Kakegawa station. 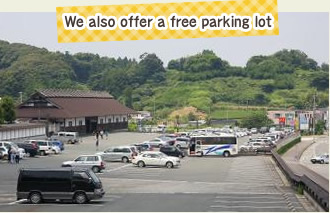 * All parking area is located outside. * If the parking lot is full, you can use a provisional parking. All aisles in this park is barrier-free without a step, people with wheelchair can comfortably have a look at all facilities. * Due to our guidelines, you cannot bring a service dog, guide dog and hearing dog. We have charged lockers (S ¥100, M ¥200, L ¥300) on the right side after the entrance. Our Kiosk can keep your baggage which you cannot put in the locker. Please experience them when you come to Kakegawa Kachouen. 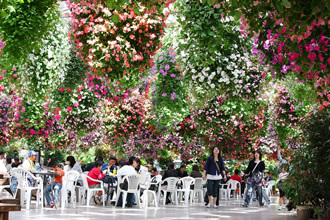 You can enjoy your food under flowers in full bloom. We have more than 30 menus with routine. We also have many kinds of desserts and drinks. Free wireless network service (Wi-Fi) is available at the part of our park. Everyone who has a wireless LAN compatible device (e.g. laptop, tablet, smartphone and etc.) can use free wireless LAN.